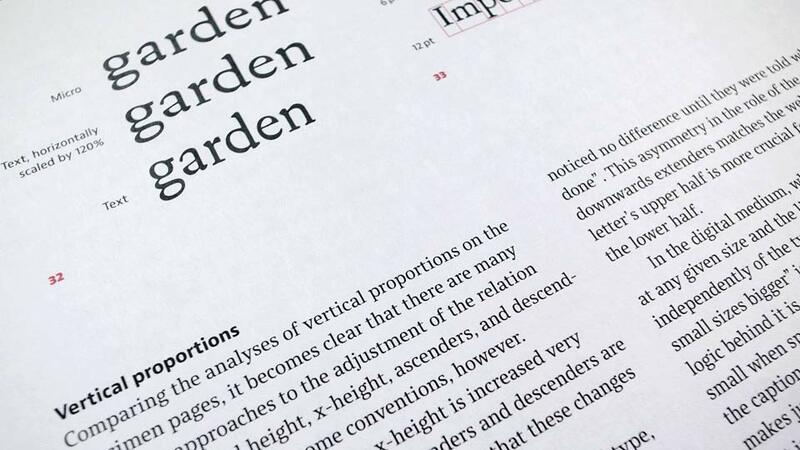 The aim of this book is to determ­ine prin­ciples under­ly­ing the design of optical sizes, with a view to giving useful advice to prac­ti­tion­ers who wish to design such sizes for their own fonts. “Op­tical sizes” are size-specific adjust­ments to type designs. They were prac­ticed for 500 years of metal type print­ing. Since punches had to be cut separ­ately for each type size, adjust­ing them accord­ingly did not involve any addi­tional effort and the optical compens­a­tions were built into the fonts. Char­ac­ters inten­ded for use in small sizes typic­ally show an increased width and x-height, reduced stroke contrast and looser spacing. In phototype, size-specific adjustments were largely given up and single-master designs dominated. This practice was continued during the early years of digital type. From the metal type era, hardly any docu­ment­a­tion on the subject is avail­able since punch­cut­ting, like other crafts, was not discussed much in writ­ing. The skills and insights were passed on from one master to the next by demon­stra­tion. 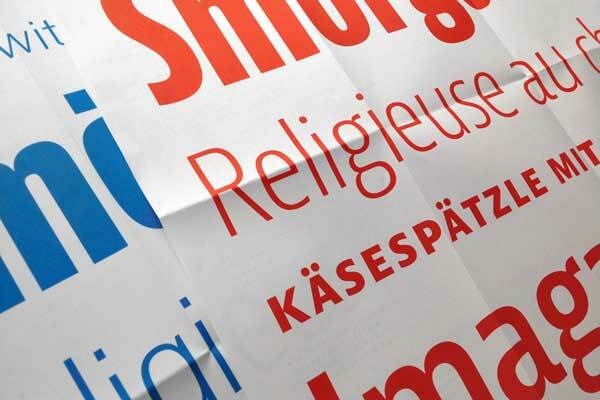 Even today the design process of optic­ally sized typefaces has rarely been recor­ded or analysed. 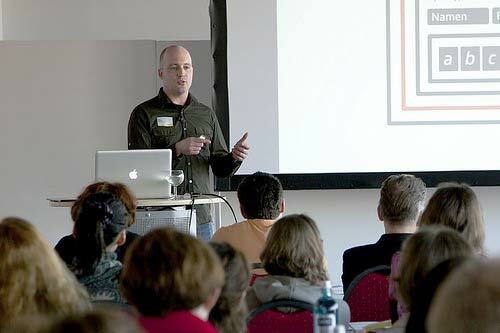 This lack of resource lead Tim Ahrens to research and write about it himself in 2007, in the hope that the outcome would become a useful source for prac­ti­tion­ers who wish to create fonts with size specific styles. The book looks into type history and percep­tion psycho­logy, and analyses designs by old masters and numer­ous contem­por­ary design­ers. We inter­viewed a number of design­ers such as Robert Slimbach, David Berlow, Akira Kobay­ashi, and Chris­tian Schwartz. Their answers, along with the analysis of exist­ing fonts, form an import­ant basis for the prin­ciples explained in the book. The most extens­ive section, “Design advice”, gives compre­hens­ive guid­ance to size specific designs based on inter­views with contem­por­ary design­ers as well as our analysis on contem­por­ary and old masters. The type speci­men section shows various metal and digital designs. 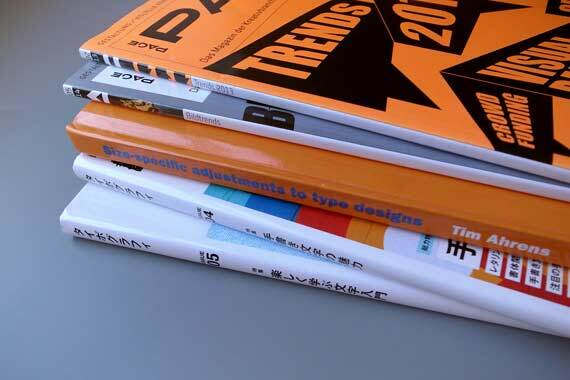 It includes the authors’ comments on each typeface and provides cross-refer­ences to other designs and the relev­ant prin­ciples in the main part of the book. The original version of this paper was written as part of Tim Ahrens’ MA in Typeface Design at the University of Reading in 2007. The follow­ing year, it was published by Mark Batty Publish­er. This first edition was produced as print-on-demand, which regret­tably resul­ted in a very high unit price and restric­ted produc­tion qual­ity. In 2013 we obtained the publish­ing rights and, since we have been constantly receiv­ing requests for the book, decided to update, extend, and re-publish it ourselves. This 2014 edition is co-authored by Shoko Mugikura, who joined extend­ing and updat­ing the content and designed the book. For more about the difference from the previous edition read our blog entry. 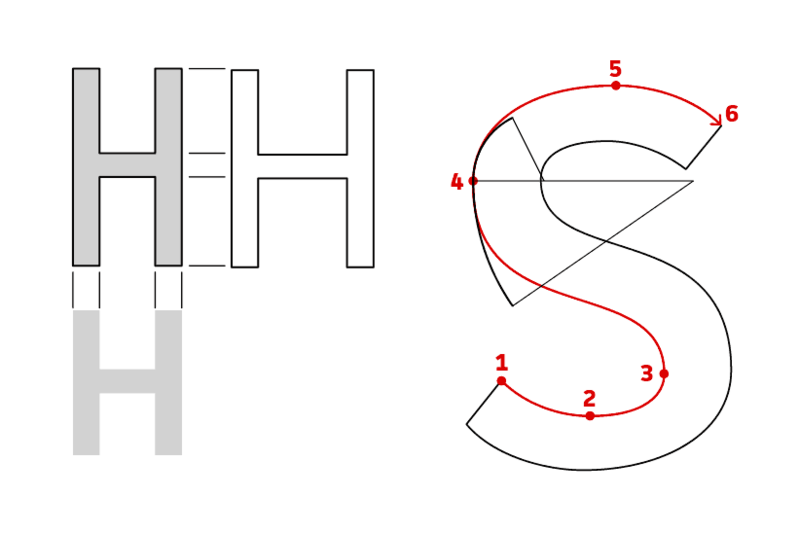 Sample sections on Suppression and emphasis of features in typeface design and on Spatial frequencies can also be found on our blog. Hand punchcutting / The role of the punchcutter / Machine punchcutting / Ink spread / What is the “true” shape? Brunel, Paul Barnes and Christian Schwartz – Schwartzco Inc.
HTF Didot, Jonathan Hoefler – Hoefler & Co. 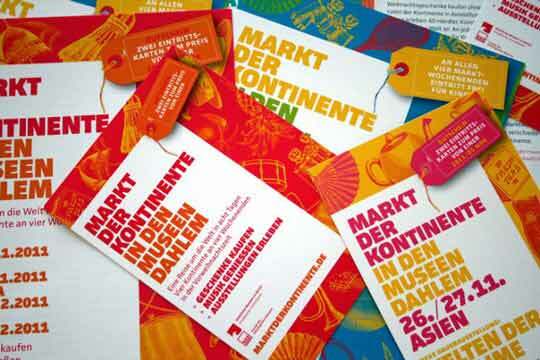 Initially we inten­ded to include all new designs published since 2008. 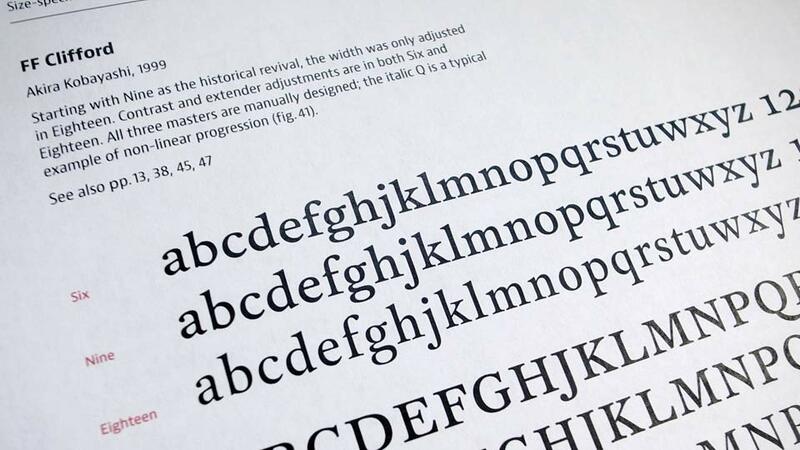 After setting speci­men pages and examin­ing them, however, we came to the conclu­sion that showing a selec­tion of typefaces would be more purpose­ful for this public­a­tion. We only included typefaces that follow an uncon­ven­tional approach in terms of optical sizing or show unusual or unique tech­niques and treat­ments of the sizes. This is not to be inter­preted as a judge­ment of quality of the designs. In fact, some of the famil­ies we omitted – most notably Modern roman typefaces, the largest category of optic­ally sized fonts – are very good designs with sens­ible size-specific adjust­ments. We would like to thank all foundries and design­ers who gener­ously provided their fonts for us to try and use. The book is usually shipped within three working days. We are not granting dealer discounts.